Now we turn our attention to folktales. The “Wise Old Woman” archetype has two primary roles within folktales. The first is as a helper, tester of worth and guide. The second is the role of the unlikely hero. The “Old Woman Helper” and the “unlikely hero” motifs are both found within two models for analyzing the structure of folktales: Vladimir Propp’s system of analysis and Joseph Campbell’s cycle of the hero’s journey. Each structure charts the common path of the hero as seen within folktales, myths and legends. This structure does not differ for the “Wise Old Woman.” She is called the “unlikely hero” within storytelling parlance, because it is not expected that someone of her gender, age and physical strength is likely to succeed in any undertaking as a hero. Nevertheless, as the hero, this character fits fully within these structures. However, when examining the “Old Woman Helper” motif, we discover that both Propp and Campbell have included this character specifically within their structures. In Campbell’s cycle of the hero’s journey, the helper may first appear as a mentor giving training, advice or a magical object that will assist the hero on his quest. The helper, if magical, may even be considered supernatural aid. Campbell writes, “For those who have not refused the call, the first encounter of the hero-journey is with the protective figure (often a little old crone or old man) who provides the adventurer with amulets against the dragon forces he is about to pass.” The female helper may serve as protection for the hero (e.g., a fairy god-mother figure). As the hero crosses the threshold, he may face a guardian that tests him to determine his worth. 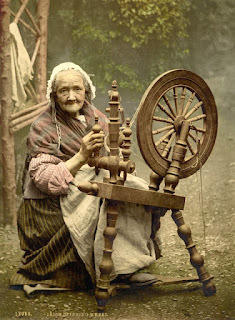 The “Wise Old Woman” archetype often plays this role by appearing and initiating (“Three Spinning Women”), by observing (“Frau Holle”) or by assisting (“East o’ the Sun and West o’ the Moon”) with the successful completion of tasks. In the Propp story analysis, characters are classified based on their actions. The helper motif appears after the hero leaves home. In this fairy tale structure, the hero accidentally meets a “donor” or provider who greets, questions or tests him. If found worthy, the hero is then given a “magical agent” (a term Propp uses to describe any magical object, qualities or guidance) which allows the hero to reach his final destination. In upcoming posts, we'll examine how these structures are found within common folk tales.